Lists are an effective segmentation tool in Wishpond where you can group your leads into different categories based on your business needs. This allows you to re-engage and target leads using Automation. Smart Lists - This dynamically populates a list where the system automatically populates it based on certain conditions. This function acts as both a segmentation and an automation tool. Static Lists - This is a stand alone list where leads are either manually added or via a separate Automation Workflow. Before we go any further, it is absolutely crucial to understand why segmentation is important and how it can benefit your business. Why we need lead segmentation for online marketing? Because your customers aren’t all the same. So, they can't be treated the same, with a generic blunt single email blast. In these social days, your customers want to feel like individuals and expect you to know them. Fortunately, it’s not all that difficult to create highly-segmented and personalized email campaigns using automation. Segmenting your emails by geographic location can be a very effective method of speaking directly to your particular group of consumers. This strategy works particularly well when location is a significant influence in the purchasing decision process. Let’s face it, men and women often speak a different language. There are general differences in what we want (or need). Segmenting your emails to target each gender may be an effective tactic for your business. This technique works particularly well if you either have a wide range of products, or if you have very gender specific stuff. Use it to both tone and message your emails to target each group. People of all ages respond to your emails. The way they respond can be vastly different depending on their age group. A college age cohort of 18-23 will be very different than a grandparent age cohort of 65-75. Segment your emails accordingly. You may find that you don’t want to send out your email message to certain age groups, but rather focus on particular age segments for particular marketing campaigns. Segmenting your emails by consumer interests can create personalized emails that and influence your click-through rates. There are a myriad of methods to segment your lists by what your markets like. You could also segment your lists by using data you have about what your contacts have downloaded, past purchases, or shopping cart wishlists. Segmenting by interests may be one of the most effective methods of grouping your consumer prospects into various email marketing campaigns. Refine your messaging, and test your results again. Tweak your segmentation tactics, and test again. Send out your most successful emails to optimize your profits. You can use your contact database generated through social campaigns or landing pages you’ve created through our tools. You can also upload your own list, or export your data rich list to other CRM’s such as MailChimp. Upload your contacts directly from your lead generation pages. Segment your contact list by gender, age range, location and even Facebook Likes. 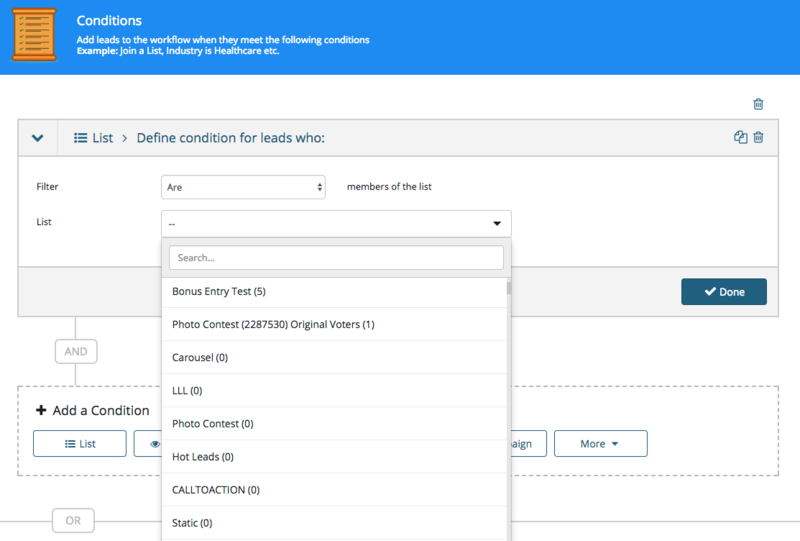 Once you've segmented leads you can choose to have members of leads as a condition in automation. You can then send personalized emails to these lists.